A spontaneous trip to Italy in the middle of the busy European summer holidays. I had a ticket to Naples and little else. No plans, nothing booked, just a hankering for good pasta and sunshine. Arriving in Naples was like stepping into a different world. The city was run down, falling apart, grimy and hectic. Yet it held its own and after some exploration, revealed its charm. Deeply tanned Neapolitans shouting out to one another from tiny, rusted balconies. The alluring smell of home cooking wafting from partly-opened windows (glimpses of nonna stirring a pot in the still, cool darkness of her kitchen). Washing, flapping in the salty breeze. Noisy Vespas hurtling through crowded streets, dodging kids, dogs, fruit sellers and tourists. Catholic shrines illuminated with neon lights. A chaotic fish market. Focaccia, pizza and a calzones for sale on every corner. Hot, strong espressos, only 60 cents. Even though Naples is the birthplace of pizza, all I could bring myself to order (for after I tasted it once I wanted nothing else) was simple tomato and basil spaghetti (spaghetti al pomodoro). 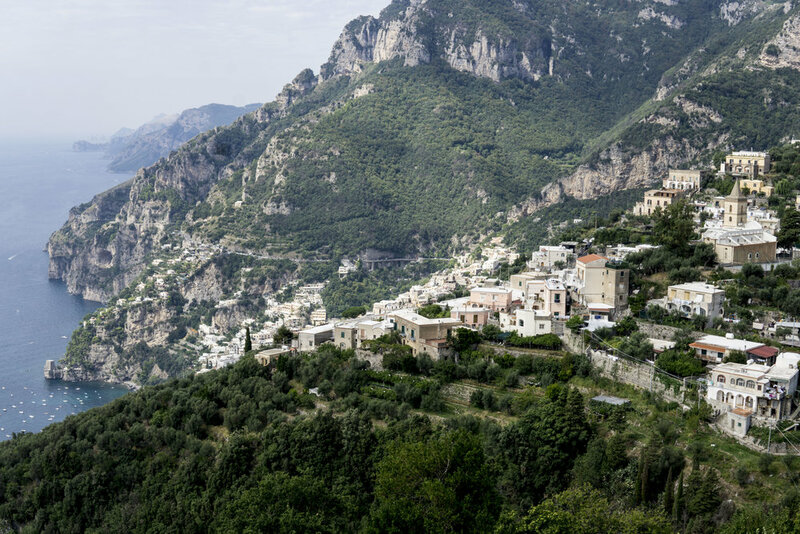 We met Giacomo in the tiny, picturesque town Montepertusoso in the Amalfi mountains, perched high above the blue Mediterranean sea. Together we foraged for wild herbs and leafy green vegetables in a green patch of land overgrown with what I'd assumed were weeds. Our passionate host Giacomo showed us how to identify what was edible and which parts of the plant to pick. He explained how the changing of the seasons affect the availability and the flavour of the plant, discussed the nutritional benefits of the plants, and described how we would use them in our cooking. Further up the mountain at his family's farmhouse, we prepared our foraged produce, and spent the following hours cooking, eating, drinking and marvelling at the spectacular view. We made cavatelli pasta from scratch, wild rocket and sun dried tomato pesto, a foraged salad, bruschetta decorated with valerian flowers, pecorino quiche, tempura pumpkin flowers, and countless other dishes. 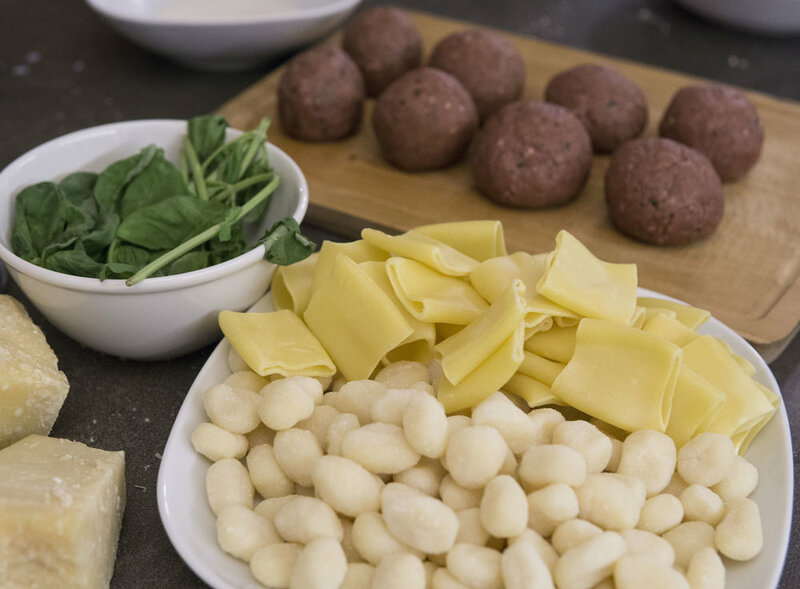 To prepare our dessert we used the same pasta dough that we used for the cavatelli pasta, rolled thin in a pasta machine and filled it with a mixture of fresh ricotta, lemon zest and wild mint. Deep fried and served with honey, garnished with wild fennel flowers. Delizioso! We drank local Amalfi white wines, and finished the meal with a digestivo of homemade fennel liqueur (strong anise flavourâ€¦ not my favourite) and homemade walnut liqueur (mmm). Given the spontaneous nature of my trip, I didn't have time to organise accommodation in Amalfi prior to arriving (and in summer it's all booked out), however Giacomo knew a place nearby that had one room available. Villa Sofia - what a location! Rafaele who owns the refreshment 'truck' in the beautiful Amalfi town of Nocelle is Sofia's son (he looks like an Italian Javier Bardem, right?!). He greeted me with an Amalfi lemon granita and pointed out the way to Villa Sofia. This family-run B&B was just perfect. So welcoming and generous, and with unbelievable views. View from the balcony of my room. Next stop - a farm located at the foothills of the Abruzzi national park mountains, in the heart of the Italian countryside. Fruit trees and vines heavy with ripe produce - apples, figs, plums, peaches, grapes. A massive vegetable garden overgrown with pumpkin and zucchini vines, green beans, lettuce and all varieties of tomato plants. An above ground pool to combat the Italian summer heat. Also, chickens, geese, horses, sheep and a donkey named â€˜Burroâ€™. Old Guiseppe is an ex-military cook. He is a keen gardener and (as Iâ€™m realising is quite common in Italy) a forager. On the farm he makes his own wine (rosato), olive oil, conserves, tomato sauce. On learning that I was interested in cheesemaking, Antonello (Guiseppeâ€™s son) made a call to the local shepherdâ€™s wife and organized a visit for me for the next day. I woke a little after 5am, downed an espresso and set off on foot into the pre-dawn morning. It was a 30 minute walk up the hill to the next town, Forcella, where the local shepherd (Enzo) and his wife (Antonetta) lived. Before I arrived theyâ€™d already been out and milked their sheep and goats, and for the next couple of hours we made pecorino cheese (pecora is Italian for sheep) and fresh ricotta from the whey. They didnâ€™t speak a word of English, and my Italianized Spanish wasnâ€™t very useful, but we somehow managed to communicate okay. To finish up the morningâ€™s work we ate a cup of fresh, warm ricotta. Why Zagarolo? Italians I told about this town were perplexed as to why I'd stayed there. To be honest, I chose this this village by pure chance. Iâ€™d put my dates into AirBnB, zoomed the map right out and randomly chose a place that was on the train line and that wasnâ€™t too far from Rome. Iâ€™m so happy I did, this was one of my memorable stays. My host, Anna Maria, picked me up from the quaint Zagarolo train station in her tobacco colored Renault, greeting me with a hug and kiss and a loud, heavily accented â€œHello, my Australian friend!â€�. She wondered if I liked wine. I told her I was partial to a glass. She called her friend Claudio, who had a vineyard nearby. A five minute drive through the hilly, semi-rural outskirts of town and we arrived at the vineyard (a beautiful Italian homestead with hundreds of years of winemaking tradition) and tasted wine and ate cheese. We left the winery and drove a short distance to Anna Mariaâ€™s home. This house is like nothing Iâ€™ve never seen before. Situated on top of a hill, overlooking fields and forest. A shrine to her late husband, the Italian artist Silvio Alessandri. The exterior covered almost completely in thick vine, the interior, an extensive and eclectic collection of art. Sculptures, wall hangings, mosaics, even hand painted tiles in the shower. It was absoltuely inspiring. That evening Anna Maria prepared the classic Roman pasta, Cacio e Pepe. Made with only three ingredients - pecorino cheese, black pepper and spaghetti - it's spectacular! Rome is a majestic city, and for the time I was there it was bathed in endless sunshine. Also, this city is flush with excellent eating opportunities. Cafes and alimentaris on every street. Picturesque trattorias, osterias and ristorantes spilling out onto sidewalks. Gelaterias, pizzarias and delicatessens everywhere. So good. SupplÃ¬ alla Romana - A type of arancini famous in rome (with mozzarella in the centre). I attended a cooking course one evening on a rooftop terrace in central Rome (it looked straight out onto an ancient Roman aquaduct - of course). Andreas and his Chinese-Roman wife Ming taught us recipes passed down from his nonna. Classic Napolitan sauce, a generic â€˜Italian sauceâ€™, and meatballs. We finished the meal with the bitter digestivo, Amari. The perfect way to wrap up a fun evening and this mini Italian adventure.